When Italy beat West Germany in the 1982 World Cup final, few could have predicted that more than a generation would have to pass before the venue, the Santiago Bernabéu stadium, could once again host an event of similar magnitude. The Bernabéu, which turns 60 this December, was recently added by UEFA to their "Elite Stadium" list, making it eligible to host the Champions League final. 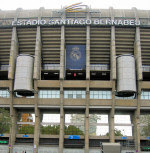 The Real Madrid stadium has hosted the final of the top European club competition three times (1957, 1969 and 1980), but only in its previous incarnation as the European Cup, never as the Champions League. The final venues for the 2008 and 2009 editions have already been chosen, and the Bernabéu will face stiff competition from the new Wembley, Munich's Allianz Arena, Berlin's Olympiastadion, and Valencia's own Mestalla for the 2010 final. The decision will not be made by UEFA until March of next year. The Bernabéu was inaugurated on December 14th 1947, when Real Madrid played against the Portuguese side Os Belenenses. The initial ground capacity was 75,432. Initially named Nuevo Estadio Chamartín after its earlier incarnation located in Madrid's district of that name, it was renamed in honour of its then president on January 4th 1955, prior to Real Madrid's unequalled run of success in the European Cup. In 1953, due to enormous demand from the fans, the stadium was extended with a third amphitheatre (known as the "gallinero", or "henhouse"). During Real's golden period, in the 1950s and 1960s, the ground held crowds of up to 120,000, mostly standing. On the international scene, the Spanish national side won its only official title thus far in the Bernabéu, beating the U.S.S.R. in the final of the European Nations Championship in 1964. In the early 1980s, the ground saw its first major refurbishment to bring it up to the standard necessary to become a World Cup venue. The façade and access to the ground were modernised, and a cover was added, decreasing the capacity to about 90,000. The distinctive access towers were added during further work carried out in 1992. Once again, the capacity increased above 100,000, to 106,500. However, according to Spanish legislation and new UEFA rules, from the 1998/99 season, all stadia had to be converted to be all-seater. Real Madrid was one of the few Spanish clubs unable to complete all the necessary alterations in time and they were granted a 2-year extension by UEFA to make the changes, reducing the stadium capacity to just under 75,000. Recent work to the stadium has once again increased the capacity to 80,354, but it has been other changes which have brought it recognition from UEFA: The Presidential Balcony was relocated to the East Stand in order to be in the same area as the press zone, the dressing rooms and all the club's administrative offices. Other changes include the new "Multipurpose" building which houses its own press and board rooms and the new Real Madrid store, the panoramic elevators and the escalators in the access towers. Curiously, no indication that these changes could bring the desired acknowledgement from UEFA was given at the recent AGM. The alterations have been cumulative, rather than as a result of some heavily hyped grand design (compare with the proposed redesign of Barcelona's Nou Camp by Norman Foster) and so it is difficult to judge whether they form part of an overall vision to guarantee the stadium's future as a venue of international renown. They will, however, suffice for now.